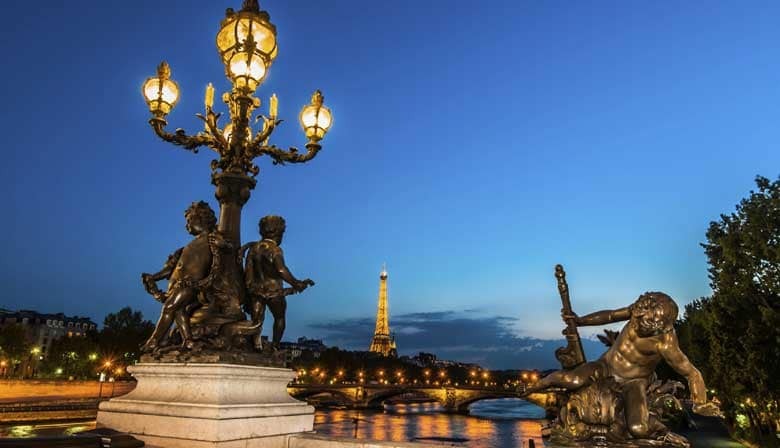 Admire the magic of Paris by night in a double-decker bus: the monuments and bridges are lit up emphasizing the fantastical atmosphere that reigns in the City of Lights. You will discover the Place de l'Opéra, the Champs Elysées, the Eiffel Tower, the Louvre, Notre Dame Cathedral, Saint Germain des Prés. Furtheremore, you'll learn about Paris' history with the registered commentary. Vendome Square, Opera Square, Comedie française, Louvre Museum, Institut de France, Pont neuf, Hotel des Monnaies, Saint Germain des Prés, Notre Dame Cathedral, Chatelet, Conciergerie, Hotel de Ville, Rivoli Street, Concorde Square, Petit and Grand Palais, Champs Elysees Avenue, Arc of Triumph, Trocadero Square, Eiffel Tower, Invalides, Madeleine Church. With the tour in a panoramic bus, you will dive into the life of the Parisians who perceive Paris in their own way. You will discover the main neighborhoods and monuments of Paris, their history and architectural evolution, thanks to enthralling audio commentaries. You will find your bearings in the French capital and immerse yourself in the daily life of its inhabitants. Easy to book, very professionally organised. Great overview of the city! Delightful outing! Did not realize we would get info about each monument or building we ere viewing ..very nice! Eiffel Tower was stunning. Great to see some different views to those seen during the day.